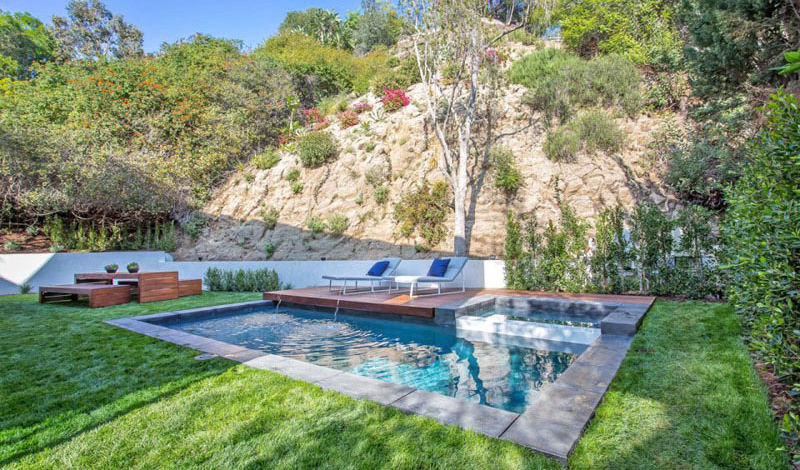 A stunning modern home featuring an inviting pool and a luxurious interior. Since modern home designs are a trend these days, we can see many houses that has this design. But although we may see similar homes with its use of colors, geometric shapes, lines and contrast of materials, we cannot doubt it that each one is still different from the other especially that each home has a unique lot area and it is designed according to the needs and lifestyles of the home owner. 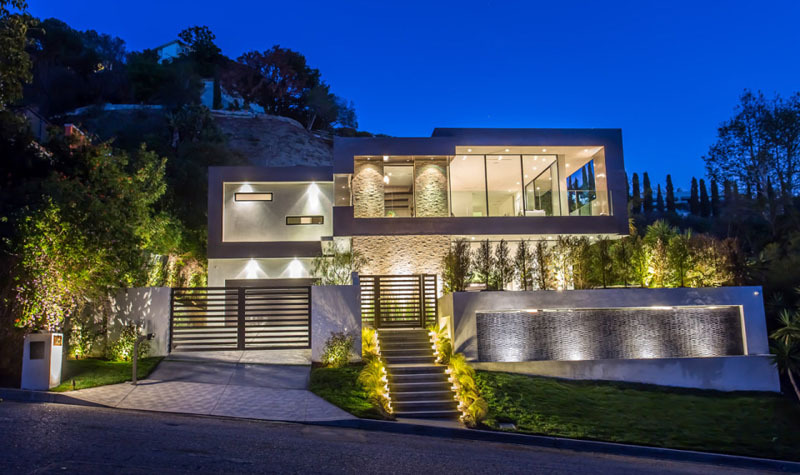 Today, we are going to feature another modern house. 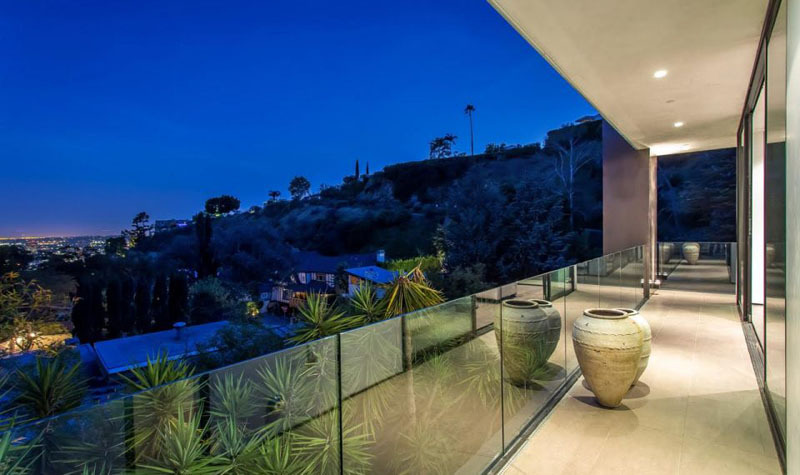 The house called Rising Glen is lighting up the Hollywood Hills in Los Angeles designed by Michael Parks of MSP Design Development. Beyond private gates of the house and through an impressive pivot front door, one can see the finely appointed interiors of the contemporary estate that convey refinement and luxurious warmth. The house is meticulously crafted with premium materials and impeccable design. In the living area, it boasts retractable walls of glass that create a seamless indoor/outdoor experience. There is an exquisite Master Suite that overlooks the sparkling city lights and boasts a tremendous walk-in closet and superbly elegant master bath. At first glance, the home is a truly unique confluence of modernity and luxury. The house is also appointed with home automation, a six-car parking and a wine cellar. Let us take a look at the house below. Unique feature: This beautiful modern house that creatively mixed modern lines and shapes in its exterior with a stunning and luxurious interior. Isn’t this a beautiful house? Well, it sure looks like one that you dream of for sure and it stands grand and tall. You can see that it used different materials in the exterior with lovely lines on it. And I like it that one will walk through the steps to get to the home’s entrance. When the house is lighted, it looks even more beautiful and dramatic. Even the plants are lighted as well as the paths too. One lovely feature of the home is its fully landscaped backyard with a swimming pool, a Brazilian Ipe wood sun deck, and an outdoor dining area. Who wouldn’t want to relax in here? Another look at the swimming pool of the house with its blue waters. It is indeed relaxing to stay here especially with the view of nature around it. What added to the beauty of the area are the wooden features in it. You can also see a wooden dining set in the yard. 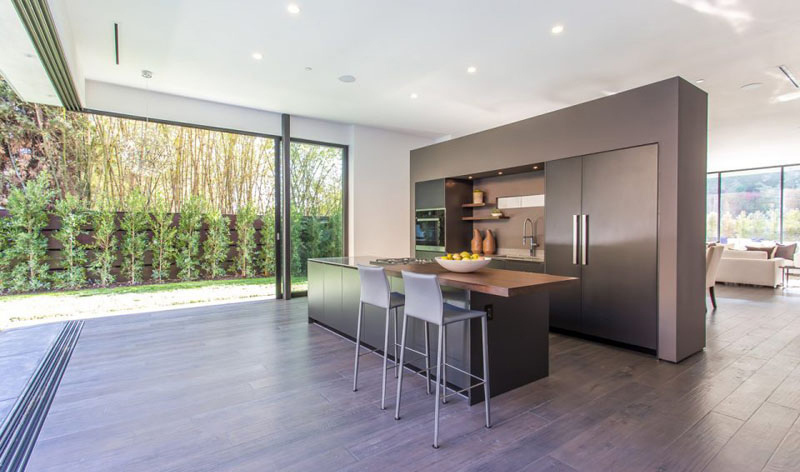 Inside the house, the kitchen opens up completely to the backyard which is perfect for entertaining and is also a perfect view while working. To separate the kitchen to the dining and living area, a partial wall was added. 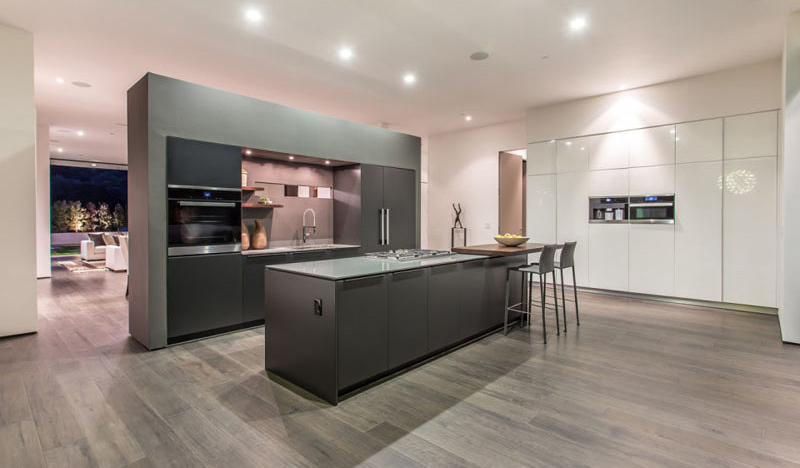 It also has an island with a cantilevered wooden counter to room for bar stools. Don’t you love the colors of this kitchen? Another look at the kitchen where we can see the tall gray bar stools in the island. The area is also open with sliding glass doors used to connect it to the outdoor space. 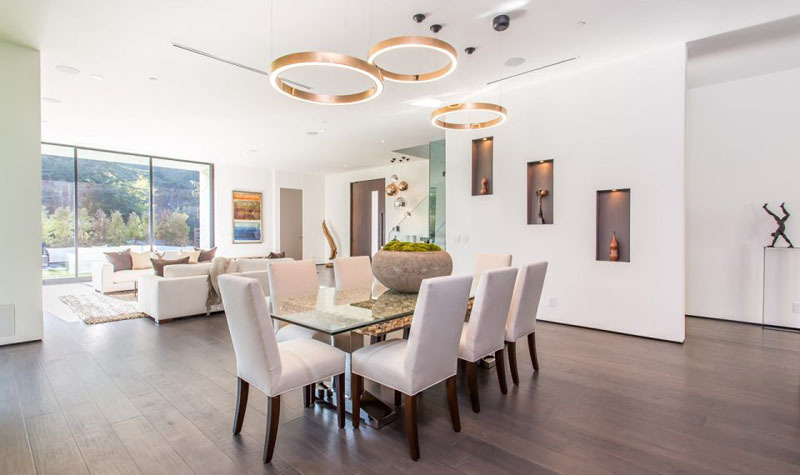 The dining area and living area share the same continuous space but what defines the dining area is the lighting. You can see here that aside from the beautiful lighting, it also has a nice centerpiece which matches the design of the table. The living room is very symmetrical with the way furniture is arranged and how it is decorated. Because of its layout, there’s plenty of room for people to socialize and enjoy the fireplace. This is the area where wine is being stored in the house. Isn’t it nice? Aside from that function, it also doubles as a wall decor too. I like this part of the house which I never expected to see in here. 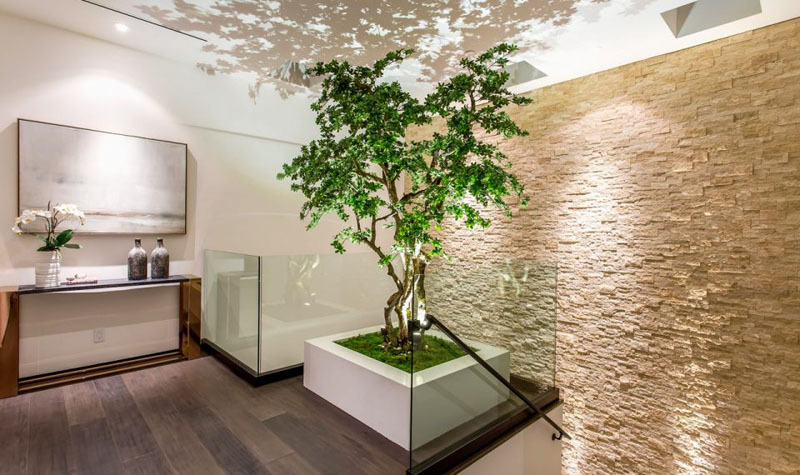 At the top of the stairs is a tree that makes a strong organic statement. 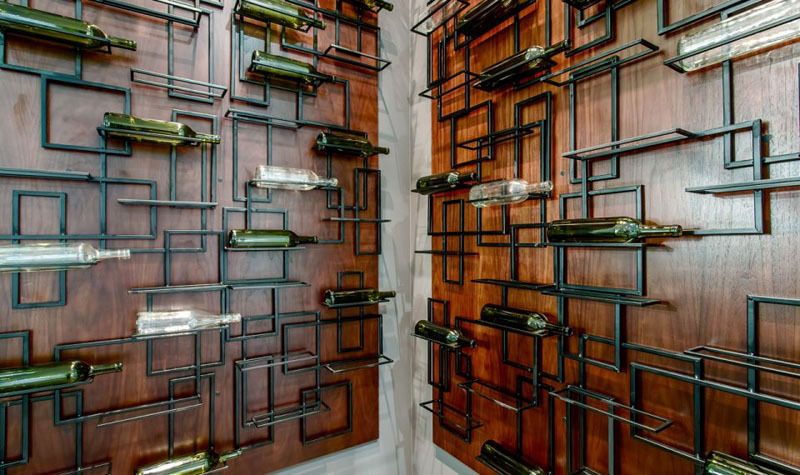 For sure, this gives you an idea to add something like this in your home. This is the bedroom which made use of wood for its bed. It sits above a shaggy area rug and it has a soft mattress just above it with some throw pillows. Aside from that, it also has a lounge area too with a centerpiece similar to that in the dining room. When creating the master suite, the designer says the intent was to “create a master suite that you never want to leave.” The master suite features a sitting room with a bar and a double-sided fireplace that separates it from the bed. Walls of glass provide an uninterrupted view of the sparkling city lights while inside the bedroom. Look at that beauty outside, isn’t it mesmerizing? The master suite also has a balcony where one can enjoy the views and get some fresh air. It is always nice to have an outdoor space like this even from the bedroom. 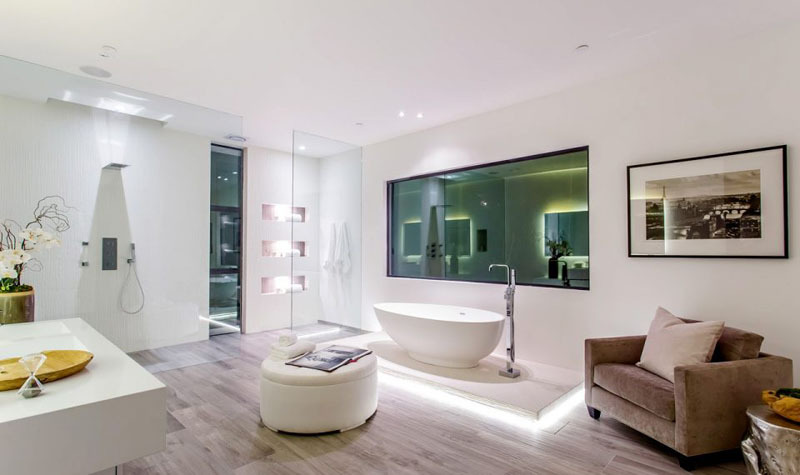 The master bathroom is very luxurious with a floor to ceiling glass partition for the shower. The bathtub has been raised on a platform surrounded by hidden lighting. The lighting in the area looks very dramatic. 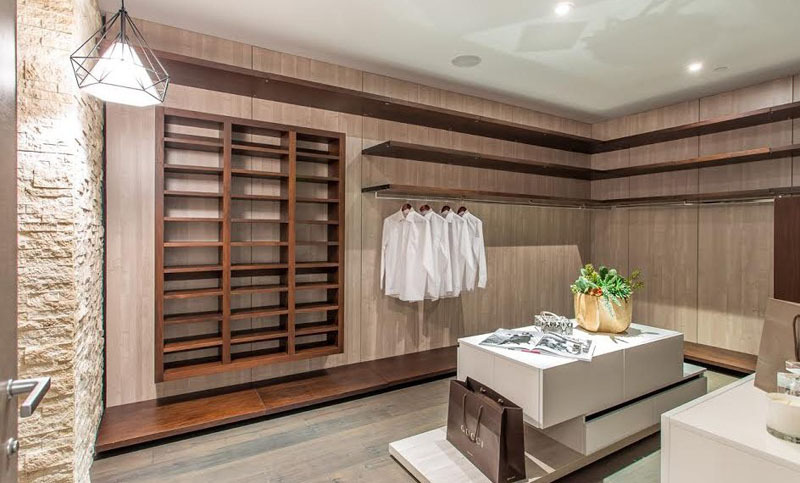 This is the walk-in closet that has plenty of wood cabinetry and shelves. Aside from that, it also has a central island for storing accessories and other items. Isn’t this a beautiful modern home? I am sure that you will agree with me that this is indeed a breathtaking home. You might say that the house looks familiar to you because it sure has many features like the other modern homes we see. But of course, this one is different and it is in a totally different location too. This house is designed by MSP Design Development who obviously did an amazing job for the house. No doubt, the owner was pleased with how their house turned out and what the designer did to it. Well, after seeing the images of the house, who wouldn’t love this house, anyway?